By Giulietta Pinna. Photography by Alicia Wiley Photography. 1. Brew Juniper Culinary Apothecary’s Pom Bomb Tea at double strength (2 tsp. tea per 8 oz. water). Let cool. 2. Combine ingredients in a pitcher or large beaker with spout. 3. Strain over ice into tiki mug. 4. 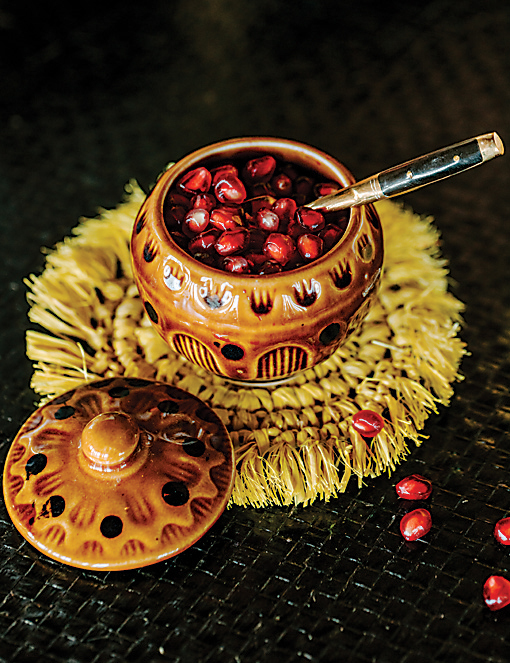 Garnish with pineapple wedges, pineapple fronds, and pomegranate seeds. 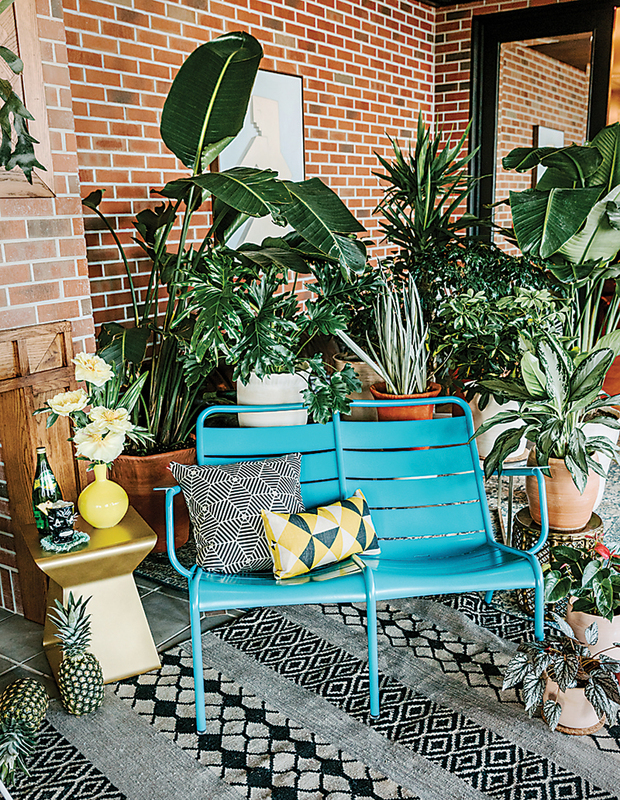 Mix it up by arranging bold outdoor furniture or décor with retro vintage pieces. 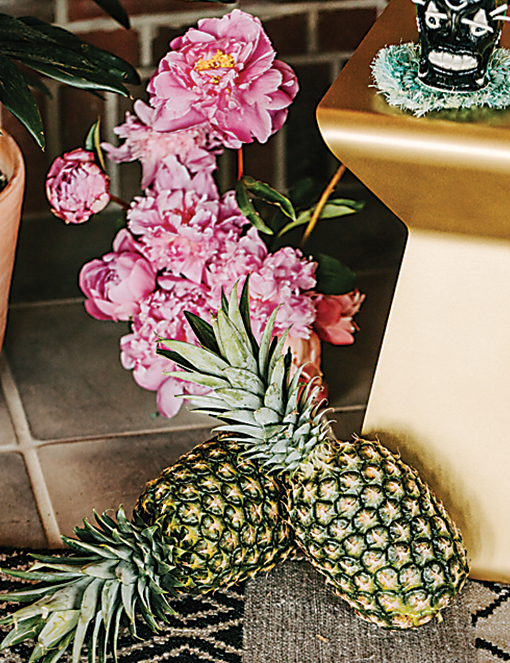 Get the jungalow look by incorporating lush, tropical plants and florals in your space. How to get everyone in the mood? 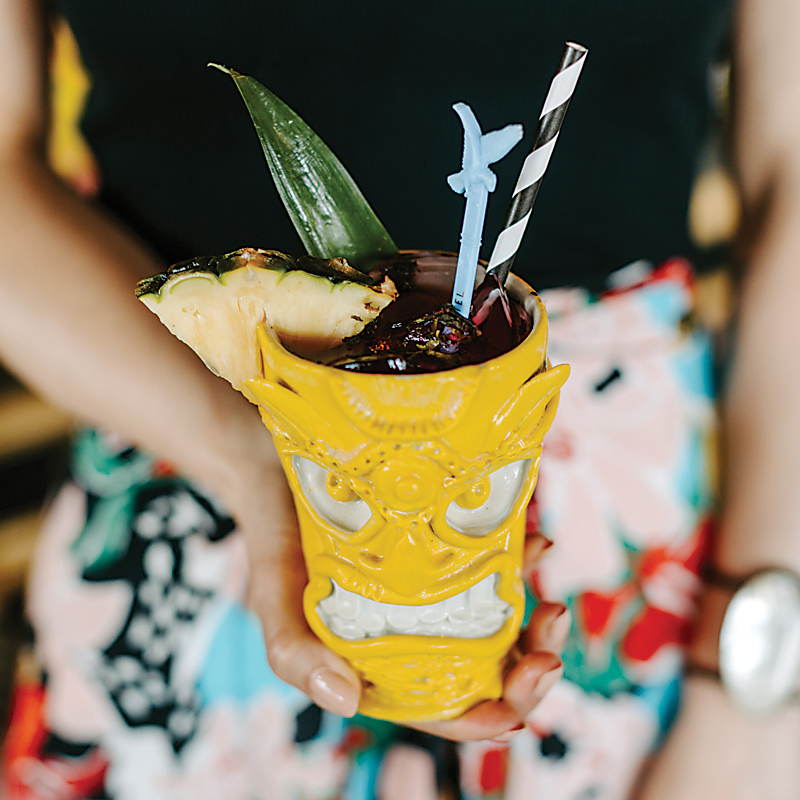 Ask your guests to come dressed in their best summer retro wear. Now, who’s ready to limbo? In the studio with ceramic artist Irene D. Salmon as she makes ceramic tiki mugs. Prop and set styling by Limonata Creative Consulting. 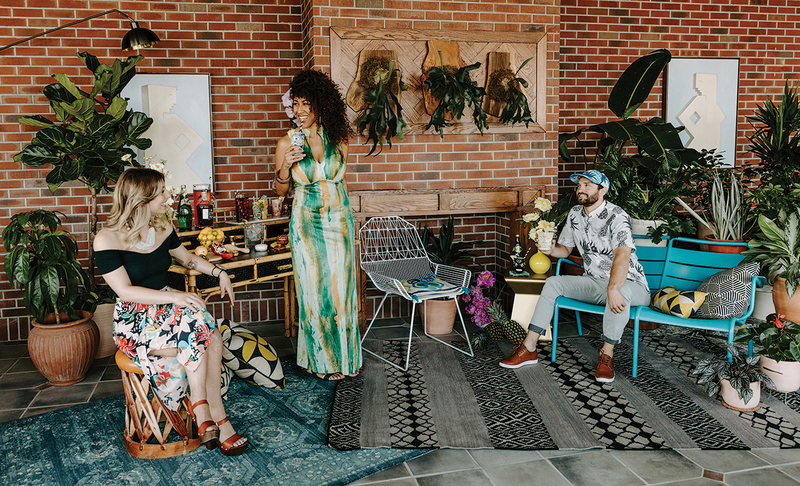 Shot on location in the Garden Room at Hotel Revival. Florals courtesy of B. Willow. Potted plants by B. Willow courtesy of Hotel Revival. Models: Raqui Minwell, Lindsay Petrick, and Kyle Ramsden. Beauty by Alana J. Hair by Shawn Sharp. Handmade ceramic tiki mugs by Irene D. Salmon ($45 each) at The Potter’s Guild of Baltimore. 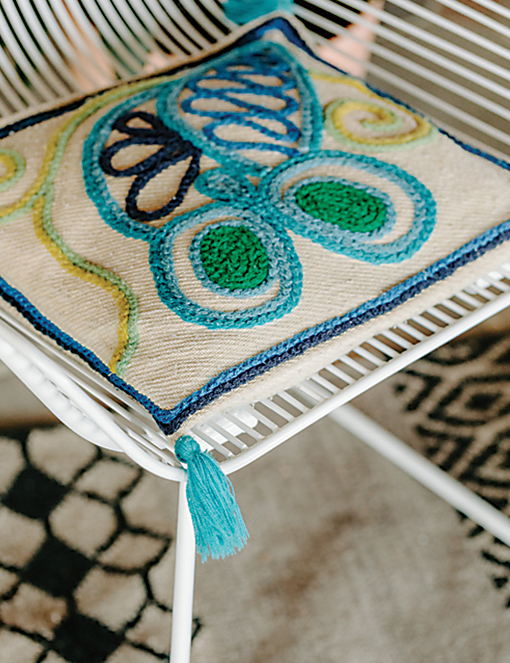 Luxembourg Duo turquoise outdoor lounge chair ($971), desert rug ($490), accent pillows ($65-95 each) at Design Distillery. Kito end table in gold by Bontempi ($320), farmhouse lounge in white by Bendgoods ($480) at MiY Home. 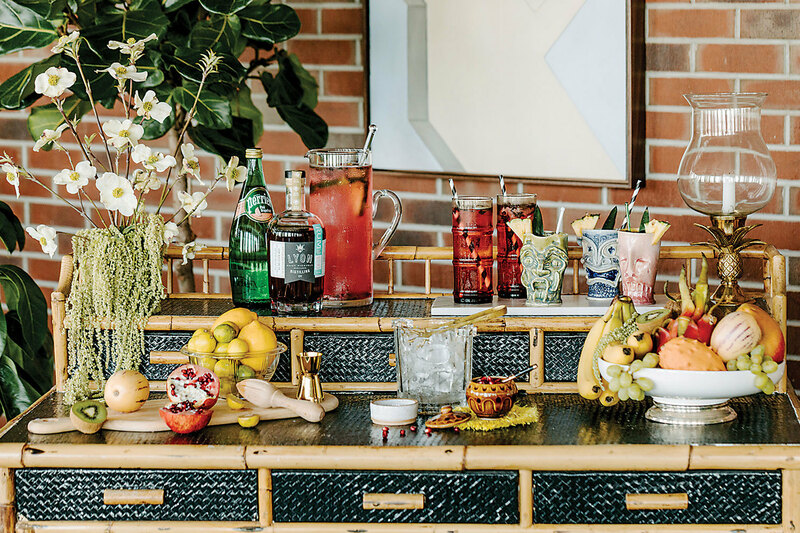 Vintage rattan desk ($600), bronze pineapple candle holder ($55), 144-piece Thai brass and rosewood flatware ($400), set of 15 bamboo highball glasses ($50) at Wishbone Reserve. Vintage embroidered pillow ($20), set of two vintage ceramic jars ($18) at Bottle of Bread. Lyon Distilling Dark Rum ($45.99) at Canton Crossing Wine & Spirits. Artwork, turquoise area rugs, and equipales stool from Hotel Revival. Black-and-white striped straws, wood cutting board, marble cutting board, glass ice bucket, brass ice tongs, vintage glass bowl, lemon juicer, white fruit bowl, glass pitcher with stirrer, grass coasters, stylist’s own. Seventies watercolor halter dress ($35), vintage white beaded necklace ($26) at Bottle of Bread. Jungle floral skirt ($84.95) at Doubledutch Boutique. Tropical granddad hat ($60) at SewLab USA.